Tue., April 11, 2017, 10:51 a.m.
MADRID – Barcelona forward Neymar has been handed a two-game suspension for sarcastically applauding an assistant referee and will miss Barcelona’s game against Real Madrid in the Spanish league. The two-match ban announced Tuesday comes in addition to a one-game suspension he was automatically required to serve after being sent off in a 2-0 loss at Malaga on Sunday. A highlight of the Spanish season, the game between the league leaders is on April 23 at the Santiago Bernabeu Stadium. A victory by Madrid could all but secure its first league title since 2012. Defending champion Barcelona is three points behind Madrid, which has a game in hand. Third-place Atletico Madrid is 10 points off the lead. 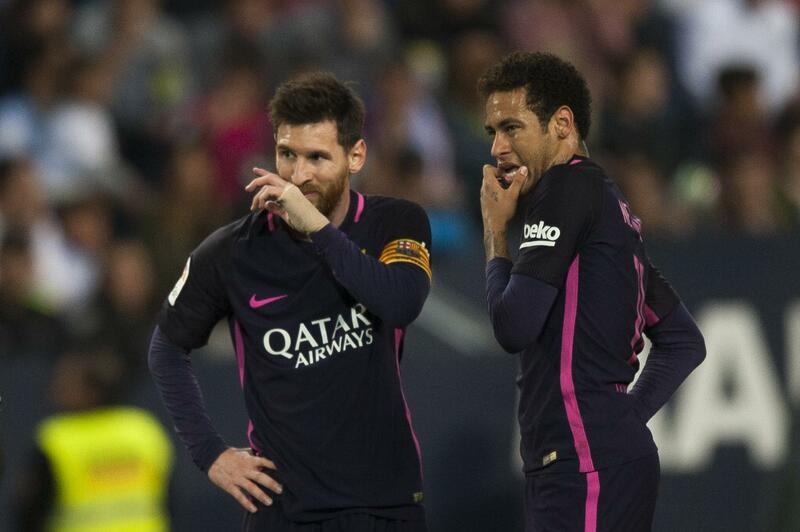 Neymar was criticized by fans and local media for needlessly picking up two yellow cards that hurt Barcelona’s chances of a comeback against Malaga. Madrid had been held by Atletico to a 1-1 draw earlier on Sunday, opening the door for Barcelona to take over the lead. The first card came after Neymar bent over to tie his boot laces and did not give space for a Malaga player to cleanly take a free kick. The second came with about 25 minutes left in the game when Neymar charged into an opponent with no real chance of winning back the ball. Upset, he left the field and applauded the assistant as he went toward the changing rooms. Referee Gil Manzano included Neymar’s sarcastic reaction in his report to the Spanish federation’s competition committee, which met on Tuesday to rule on the case. Barcelona, which is expected to appeal, had tried to defend the player by saying that he didn’t directly address the assistant and never yelled or touched any member of the match officials. The committee included in its ruling its “concern with the clear and unacceptable pressure by part of the media” in relation to its decision. The first league game Neymar will miss is at Real Sociedad on Saturday. After the Madrid game, he will also have to sit out the match against last-place Osasuna. There will be four games left in the league when he returns to the squad. Published: April 11, 2017, 10:51 a.m.